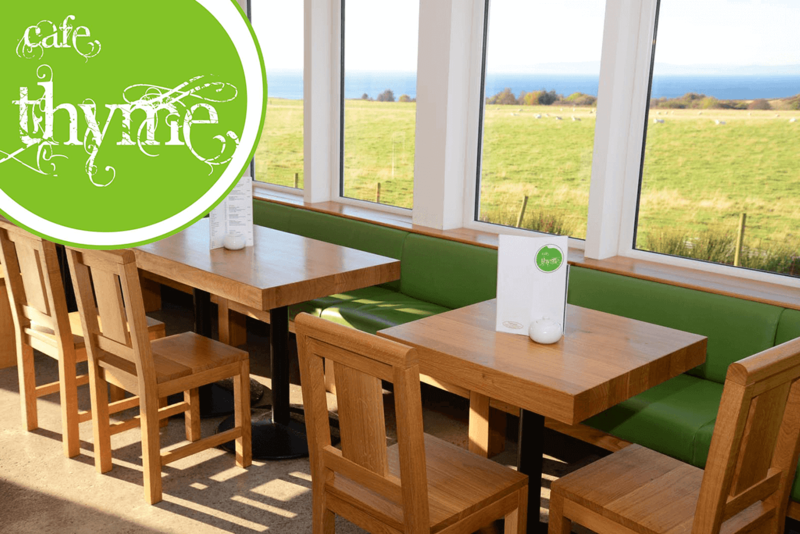 Visit our new Cafe Thyme at the Old Byre Showroom which opened on June 1st 2012. Following the success of our previous tiny coffee shop we took the plunge and built a bigger one! Now seating up to 40 you can enjoy teas, coffees, homebaking and delicious lunches, our ethos being to serve freshly prepared food that is not served everywhere else - we dare to be different! Wherever possible we source local and Scottish produce and ingredients. Scottish cheese, eggs, milk, ice cream, butter and fish are generally used and we use local vegetables and meat when seasonality allows. Hamza (the chef and husband of Lorna who runs the shop) has hand built a wood burning oven the same as those in Turkey. From this you can sample home made flatbread and pides (Turkish style pizzas/calzone) which are very more-ish!.We have even married the Turkish/Scottish together in a haggis and cheese pide! We also grow our own salad leaves and herbs which are used widely in our food and offer an extensive range of loose leaf teas. Also licensed you can enjoy a beer or glass of wine while admiring the view of the Druid standing stone - this is also replicated in the stunning stained glass window. The views are spectacular of the natural fields, sea and the Mull of Kintyre behind. We are open every day 10am - 5pm, lunch is served 12-3pm. We can cater for special parties and functions with prior notice. Telephone 01770 840608. Various dietary requirements can be catered for, including gluten free, vegetarian, vegan and dairy free diets. If you have any dietary requirements please do not hesitate to ask and we will endeavour to fulfill them.